For some students, education happens inside the classroom. For students in the Washington Initiative, the learning occurs in the real world. This course, taught by adjunct instructor Catherine Poulin and offered during the fall and spring semesters, allows students to engage meaningfully with D.C.-based nonprofits. As a branch of the Kogod Leadership and Applied Business (K-LAB) program, the Washington Initiative fall course is designed to extend education beyond the classroom and into an experiential learning nonprofit environment. According to Poulin, the students in the course are given a consulting assignment with a nonprofit partner. The partners vary from semester to semester. 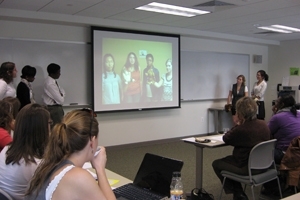 Last year, students were asked to develop a social media strategy and capital campaign for a partner organization Poulin described the project as a complete take on researching social media and discovering effective uses for Twitter, Instagram, and Facebook in order to reach a target audience. According to Poulin the Washington Initiative is a win-win for participating students and the organizations they serve. "It's a great way for a nonprofit to gain some expertise or some hours of dedicated labor, for something that they don’t necessarily have in their budget," Poulin said. "Meanwhile the students get some consulting experience, and they get to go learn about the organization, their program, their mission, and to really think from a business consultant’s point of view." Poulin believes that one of the most important experiences that any Kogod student can have is with a nonprofit organization. She says there’s a strong need for great business people in nonprofits. "For nonprofits to survive, these people really must have strong business knowledge," she says. Apart from consulting opportunities, the Washington Initiative includes guest speakers from community organizations, including ThriveDC, United Planning Organization, Community of Hope, Community of Impact, and Homeless Children's Playtime Project. Ultimately, according to Poulin, the Washington Initiative "is about how a Kogod student can take what they’re learning in their classes and applying it to their careers in various situations and in various ways."